Robbery Investigators of Texas (RIOT) was founded in 2012 and is a non-profit 501(c)(3). RIOT serves to promote training and partnerships that exist between law enforcement and corporate security professionals. RIOT accomplishes this mission by hosting an annual training convention in destination locations across the State of Texas. RIOT is the only robbery association in the State of Texas and one of three in the United States. The annual RIOT Training Convention is held in August. In 2013, the inaugural RIOT Training Conference was held in Austin, Texas and hosted approximately 130 attendees. Our 2018 RIOT Training Conference was held in Frisco, Texas and hosted over 500 attendees. RIOT is growing at a phenomenal rate! 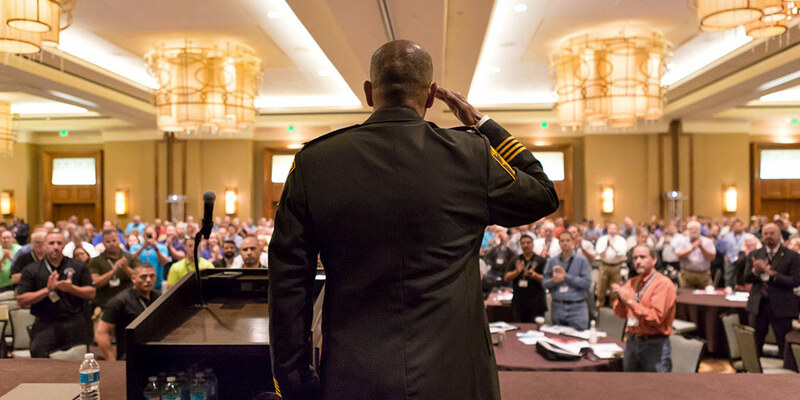 In 2019, the RIOT annual training conference transitioned from Texas Robbery Conference to the National Law Enforcement and Corporate Crimes Convention. The RIOT Convention has earned the reputation as the most prestigious law enforcement and corporate security training convention offered in the United States. We maintain this reputation due to the partnerships we’ve established with our loyal attendees and tremendous sponsors. RIOT strives to provide attendees valuable training at an exceptional venue that promotes and develops relationships between law enforcement and corporate security. RIOT is well known for their themed convention challenge coins and mugs along with their inspirational keynote speakers. Past keynote speakers include former Milwaukee County Sheriff David Clarke, Lieutenant Colonel (Ret) Robert Darling, Mark “Oz” Geist, U.S. Representative Louie Gohmert, U.S. Representative Clay Higgins and Lieutenant Colonel (Ret) Allen West.